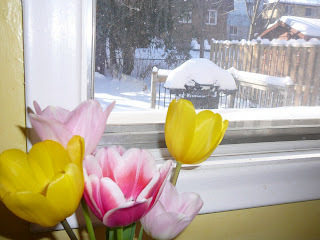 OK so maybe Spring fever is a bit of a stretch but my Valentine tulips against the snowy window is a fun sight. 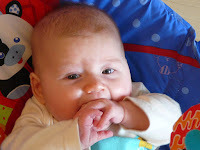 Poor Rosie is definitely teething now, hardly able to get through a nap without fussing and inconsolable crying, poor thing. We're finishing up a tube of Bonjela teething gel that Heather had leftover from their days in England and thank goodness Uncle Chad has just informed me that more is on the way! Rosie is so funny, she'll be crying like mad until I rub her sore gums with the banana, sickly-sweet tasting gel, and then she breaks out into the biggest grin you can imagine. I guess somebody will develop a sweet tooth very early on! And just to let you all in one this one, all the while I'm typing this, William is wandering around singing, 'Nobody loves me, everybody hates me, I going to the garden to eat worms!' 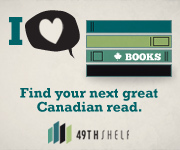 Thank Sharon, Lois and Bram! Those are going to be cold worms buddy.